What Documents Do I Need to Pursue a Medical Malpractice Case? Call the law offices of Cardaro & Peek today. If you believe that you are a victim of medical malpractice in Baltimore, Washington, D.C., or beyond, the first step you should take is to call the law offices of Cardaro & Peek. 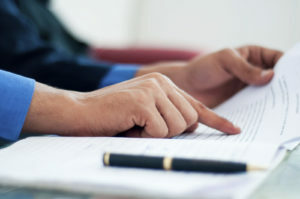 Once you schedule a consultation, you may be asked to gather a series of documents to help outline your case. A qualified medical malpractice attorney can also assist in obtaining the necessary documents. Medical records are essential for pursuing a medical malpractice case. It’s important to show records of the negligent care at issue and, if possible, any treatment that occurred after the incident took place. Most medical records are given to patients once they’re discharged, but you may need to submit a request for further information to the facility or medical professional. You are entitled to your own medical records. Providing your medical bills shows proof of your expenses. You may be able to recover damages for the expenses incurred due to the medical malpractice, so it’s important to show these documents to your attorney. If your case involves a wrongful death, you must provide your lawyer with a death certificate or autopsy. If you are aware that an autopsy occurred, inform your lawyer as soon as possible. If your case involves a wrongful death and there is no will, the family must choose someone to act as the Personal Representative of the Estate. The family must then obtain a Letter of Administration from the Register of Wills Office in the county where the deceased loved one resided by showing a Death Certificate and the consent of the other surviving family members. The lawyers at Cardaro & Peek are happy to explain the process to you. Many victims of medical malpractice suffer from injury and are unable to work as a result. If you find yourself in the position where you are unemployed due to your medical malpractice injury, provide your lawyer with the necessary documentation. Examples of documentation include pay stubs, tax returns, and other evidence of previous income. In the event of medical malpractice, health insurers and government programs like Medicare may be entitled to repayment of medical bills. If your procedure (or the victim’s procedure) was paid for by a health insurer, gather the benefits and bills received to show your attorney. The lawyers at Cardaro & Peek, LLC have the experience and resources necessary to investigate and litigate all types of medical claims throughout Maryland and Washington D.C. Cardaro & Peek, LLC has medical personnel on staff and has access to nationally recognized, board-certified physicians and other experts, to assist in the investigation, analysis, and prosecution of all types of medical malpractice claims. If you or a loved one have experienced malpractice, give us a call at 410-752-6166. Please visit our website www.cardarolaw.com and follow us on Facebook, Twitter, Google+, and LinkedIn for more information. This entry was posted on Thursday, February 7th, 2019 at 11:44 am. Both comments and pings are currently closed.